It’s upon us – gorgeous maple leaves; cooler, crisp temperatures; and the return of outdoor entertaining. 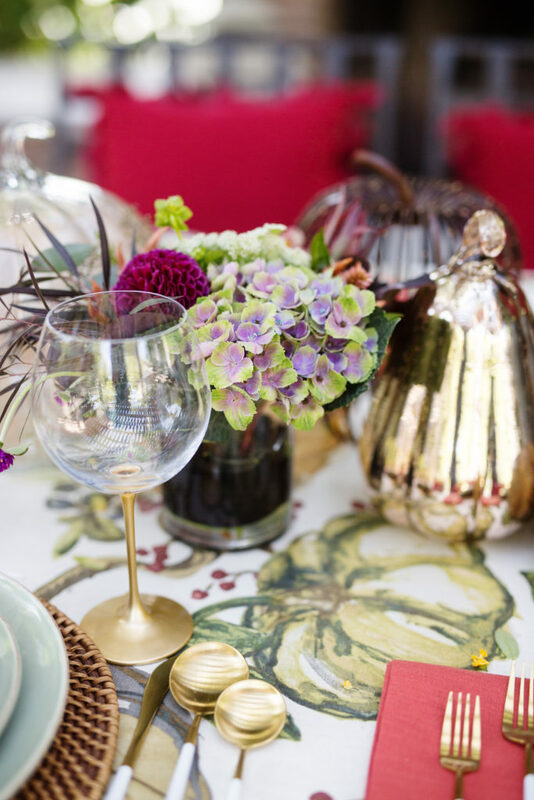 Yep, Fall is in the air and I’ve got a stunning harvest supper table to celebrate the bounty of the season! Inspiration for this farmhouse table came from incorporating traditional autumn decor, like pumpkins and leaves, but also from fresh florals and linens in jewel tones. 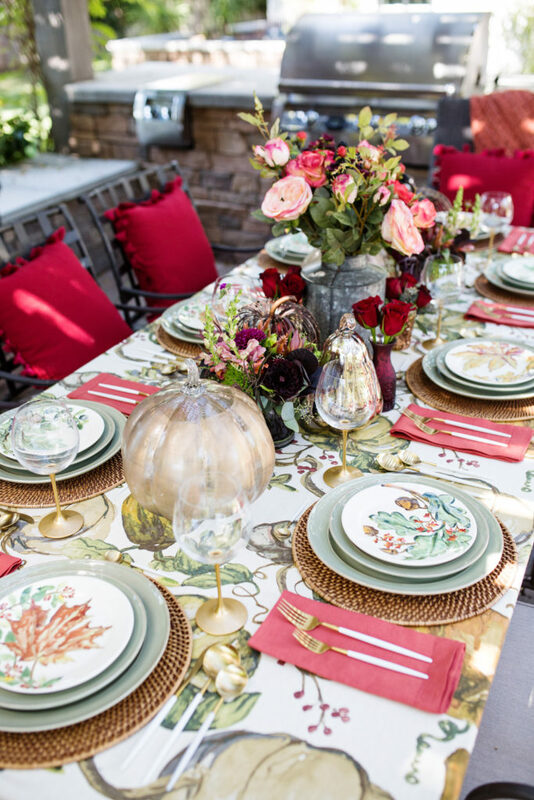 Let’s bring the dinner party outside again with festive decor for gathering friends and family. 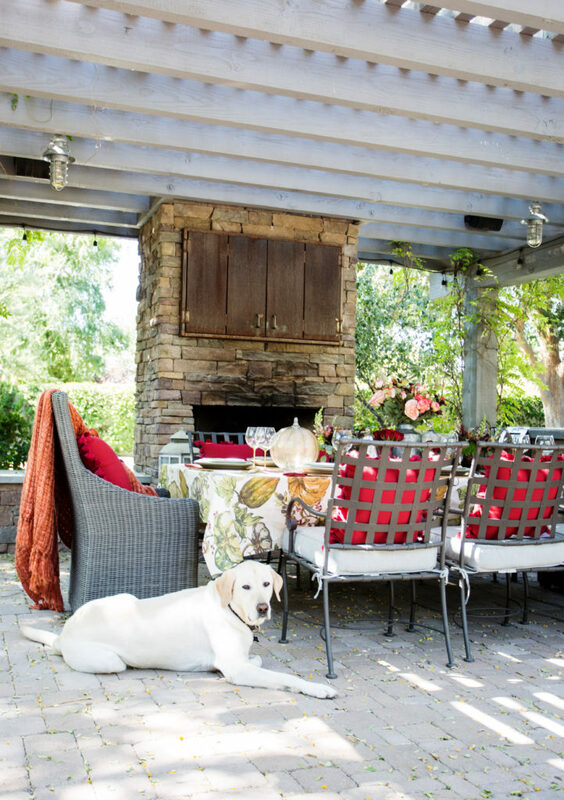 Crisp Fall air is just calling to entertain outside – and I’m listening! Starting off with a fabulous tablecloth sets the tone for your table and creates a canvas to build upon. 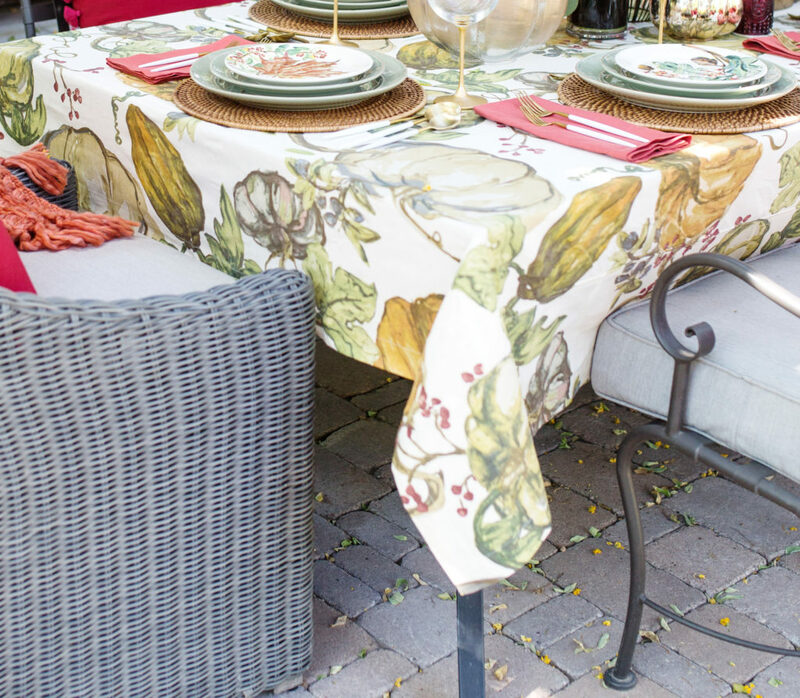 When I saw this harvest tablecloth pattern, I knew it would be perfect as a larger overlay for my dinner table. Belgian flax linen napkins in a beautiful terra cotta hue pick up the colors in the tablecloth. Bonus that these napkins are machine-washable and don’t need to be ironed because they already have a soft, lived-in feel. Pro tip: To get out wrinkles on linen, simply spray with water and smooth towards the edges. Or, if you have a steam cycle on your washer, use that and hang over a chair to dry. Glazed celadon stoneware dishes with a hand-applied patina and rubbed edge give an artisan feel to this dinnerware. 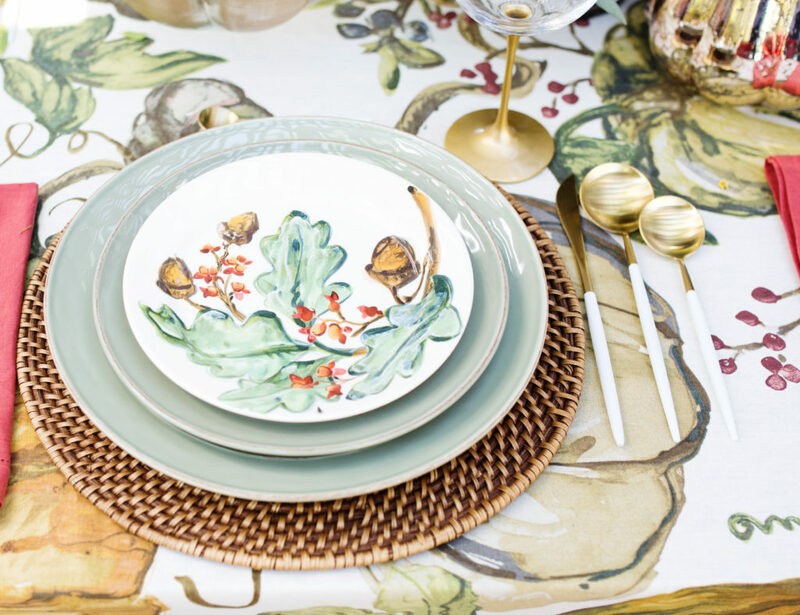 Starting with a natural honey-colored rattan charger and ending with appetizer plates depicting autumnal leaves, these are layered for a perfect touch. 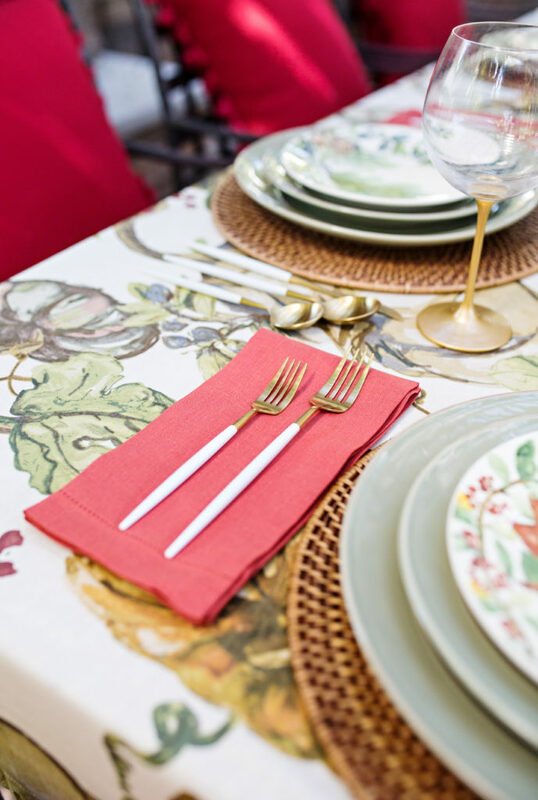 My trick to making a place setting look elegant no matter what the dishes are made of – layering! These watercolor leaf plates come in a set of 4 and each are different, so your guests get a variety of Fall! As soon as I saw these small plates, I snapped them up because I can use these all season! Using different textures and materials for the centerpiece adds dimension, depth and interest to any table. Rose gold glass pumpkins and gold mercury pumpkins, wooden gourds, and beaded wire pumpkins hurricanes lend themselves to the theme without being gaudy. Pumpkins are multi-purpose this time of year – Fall table, Halloween and Thanksgiving! Florals are a blend of both real and faux roses with blackberry accents. 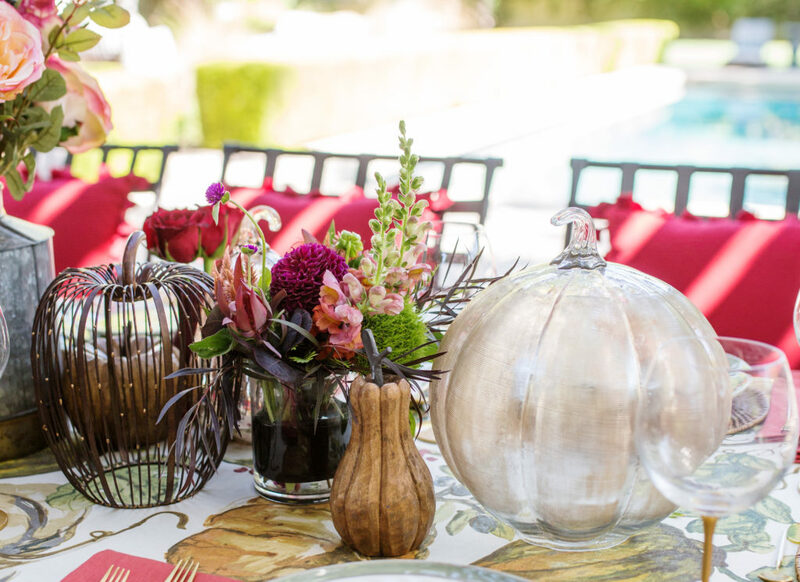 A weathered galvanized tin vase graces the middle of the table while antique jewel-toned votive holders are scattered amongst the pumpkins. Can you believe the florals in the galvanized vase are faux? The red roses are real. Mixing the two is a great way to get more use out of them! Purple, violet, burgundy and gold – all colors of this glorious season! Switching pillows is such an easy way to change the look of your table. Outdoor cherry red Sunbrella tassel pillows add some flair to the table while rust-colored chunky knit throws on the end chairs add a bit of coziness to the crisp evening air. The gorgeous jeweled gold bracelets are courtesy of my friend from Seneca Jewelry! Cheers to a happy and bountiful Fall season! Palmer is ready for Fall. Are you? 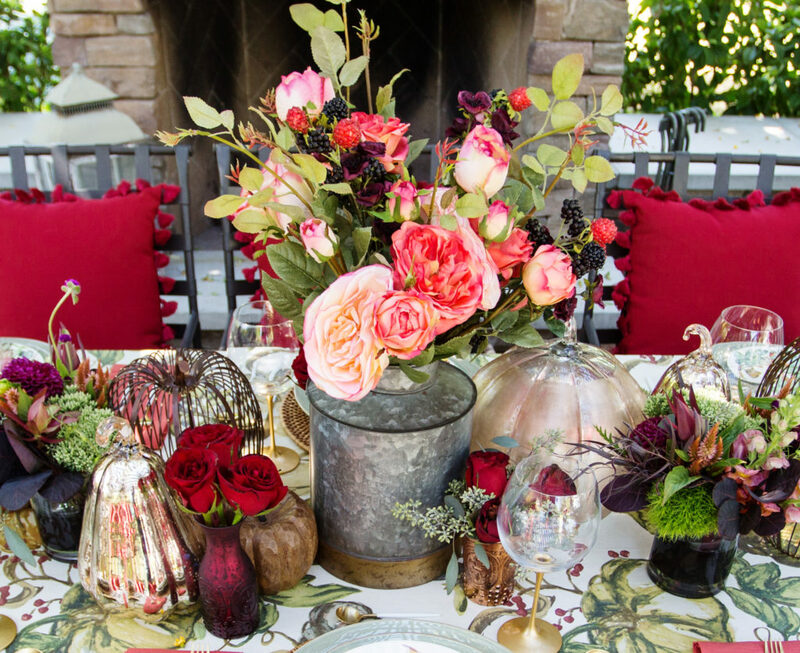 Wow, the way those reds and golds pop together…what an inviting Fall table. You are always so good with the details. The whole look is so cohesive. Looks like a Pottery Barn display in the store. I love the deep reds! Hi Hannah! Thank you – I love those colors this time of year too! The jewel tones add so much richness to the scheme.